Rep. Pat Meehan, R-Pennsylvania, stands with House Speaker Paul Ryan, R-Wisconsin, for a ceremonial swearing-in and photo-op during the opening session of the 115th Congress. Beleaguered U.S. Rep. Patrick Meehan, R-Pa., announced his resignation Friday – three months after news broke that he used taxpayer dollars to settle a sexual harassment claim filed by a former staffer. Meehan earlier announced he would not seek re-election. But the Republican released a statement saying that stepping down now "is in the interest of the constituents." 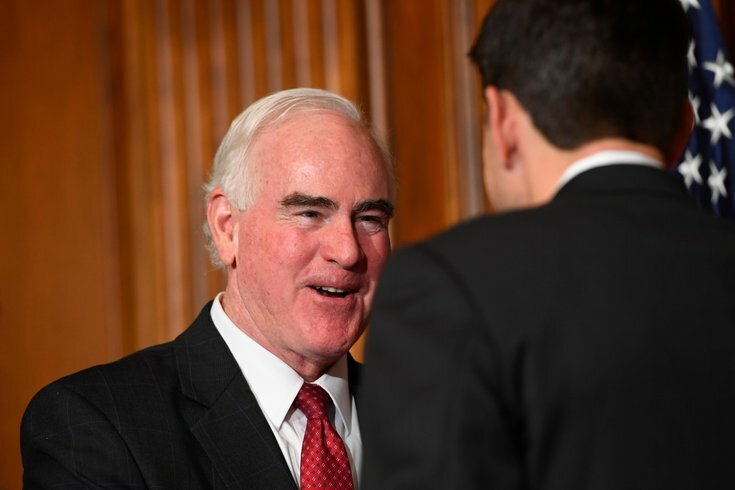 "I have stayed to fight for important priorities like fully funding our troops, increasing support for medical research and preserving promising clean energy solutions," Meehan said. "And now that work is accomplished." Meehan, who has represented the Seventh Congressional District since 2011, used taxpayer money to settle allegations from a woman who accused him of "making unwanted romantic overtures" to her. Meehan, 62, of Upper Darby, Delaware County, pledged to repay $39,000 to the U.S. Treasury within 30 days of his resignation. His statement said he did not want to leave office "with any question of violating the trust of taxpayers." "While I do believe I would be exonerated of any wrong doing, I also did not want to put my staff through the rigors of an Ethics Committee investigation and believed it was best for them to have a head start on new employment rather than being caught up in an inquiry," Meehan said. "And since I have chosen to resign, the inquiry will not become a burden to the taxpayers and committee staff." Meehan reportedly professed "romantic desires" for the woman after she became involved in a serious out-of-office relationship last year. He later called the woman his "soul mate" in an interview with WHYY, claiming he had a deep affection for her but never displayed romantic feelings for her. Meehan is married with three children. "I am deeply grateful to my wife who is so supportive, and who has made many sacrifices in her own career so that i could pursue mine in public service," Meehan said. "I am equally thankful for the unwavering support of my children." Operations at Meehan's congressional offices will be transferred to the Clerk of the House until a successor takes his place. Gov. Tom Wolf has 10 days to declare a special election. Meehan's district is considered among the most gerrymandered in the country. It includes portions of Berks, Chester, Delaware, Lancaster and Montgomery counties. Earlier this year, the Pennsylvania Supreme Court declared the state's congressional lines unconstitutional. It released a redrawn congressional map, those new boundaries would not take effect until the general election in November. According to the redrawn line, much of Meehan's Seventh District will be comprised of what is now the Fifth congressional district.